We’ve all heard that diamonds are a girl’s best friend, but diamonds have been loved and worn by both men and women for centuries. They are incredibly popular gemstones for fine jewelry in Austin and around the world. Diamonds also happen to be the birthstone for the month of April. Here’s some great information on this fabulous gem. Diamonds are formed around a hundred miles beneath the earth’s surface under incredible amounts of pressure and at temperatures nearing three thousand degress Fahrenheit. They reach the surface via volcanic eruptions, coming out in a type of rock called kimberlite. Sometimes diamonds are found by mining and processing kimberlite, and other times they are found in alluvial deposits, having naturally weathered out of the rock and been swept up by streams, rivers, oceans, and glaciers. Meteorites that fall from outer space to earth have sometimes been found to have tiny bits of diamond inside them. In ancient times, diamonds were thought to have formed as a physical manifestation of lightning when a bolt struck the earth. First becoming popular in what is now India, these gems were thought to have healing powers, such as curing brain and blood diseases and disorders of the pituitary gland. They have long been associated with mystery, romance, magic, power, and greed. Today, diamonds symbolize enduring love because of their strength, and they are associated with sixtieth and seventy-fifth wedding anniversaries and are the most popular choice for engagement rings in Austin and elsewhere. Diamonds are mined in South Africa, Botswana, Australia, India, China, Russia, Brazil, the United States, and Canada, to name a few locations. 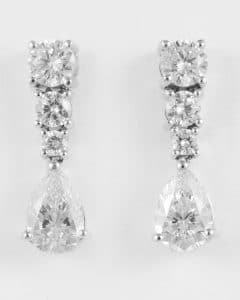 When we think of diamonds, we generally think of the colorless variety, which is the second-most commonly found. Yellow diamonds are the most common, but these gems can also be red, pink, blue, green, black, and more. Diamonds are very versatile gems when it comes to crafting fine jewelry, and they look wonderful in nearly any setting. If you’re interested in diamond jewelry, visit Copeland Jewelers, your Austin jewelry store, to see our fabulous selection!